Is This Shelter Right For You? With 6000 PSI concrete that is reinforced with steel rebar, the In-Ground Concrete Slope-Front Shelter offers the same great protection as our flat-top model, but unlike the flat-top shelter, this shelter features the most room for the money, and a much more gentle slope when going down the stairs compared to the Underground Flat-Top Concrete Shelter model. It's easier to get in and out of for kids, pets, and the elderly. 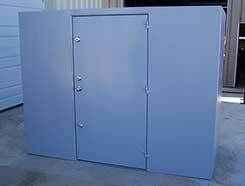 For those of you who like the idea of an underground shelter, but prefer not to have to go outside during a storm, our Under Garage Storm Shelter combines comfort with safety. 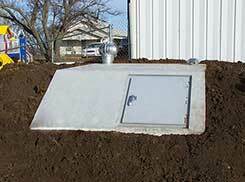 Unlike our above ground safe rooms, this shelter doesn't take up any space inside your home. 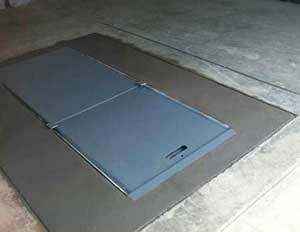 We install this shelter in your garage and it is flush with the ground, and it typically takes less than a day. 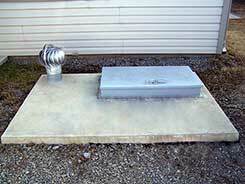 Underground protection without ever having to leave your home. 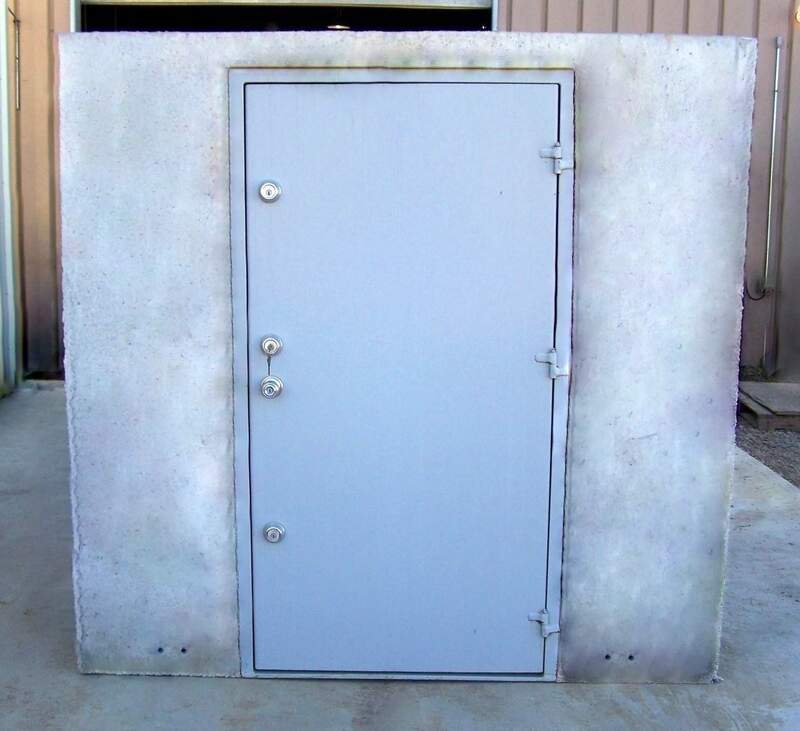 Featuring seam welded, plate steel panels from top to bottom, with multiple 16,000 Lbs stress anchor bolts firmly securing it to the ground, our Above Ground Safe Room is guaranteed to offer you the protection you and your family deserve. Its triple locking, double-plated steel door is designed to be strong and secure, and because it is wide enough for most wheelchairs to enter with ease, you can keep your entire family safe, even your pets! Provides ease of access and handicap accessibility. With 6000 PSI concrete that is reinforced with steel rebar, our Underground Flat-Top Concrete Shelter offers the same great protection as our slope-front model, but unlike the slope-front shelter, our flat-top shelter features a flat surface that doesn't stick out of the ground nearly as much. Takes up a smaller footprint; not as visible as the slope-front. Are you a Concerned Citizen? Do you think your community could be more prepared? Communities across the country are putting together preparedness programs to give their area the protection and peace of mind it deserves. Be a leader in your local community. Get pricing, and then take it to your local community leaders. Post it on your local social media. Help you community be protected today. Are you part of Business or Industry? We service business and industry from Small Childcare Facilities to Large Industrial Factories. We can protect your Family of Clients and Workers! Although tornadoes occur in many parts of the world, these destructive forces of nature are found most frequently in the United States east of the Rocky Mountains during the spring and summer months. 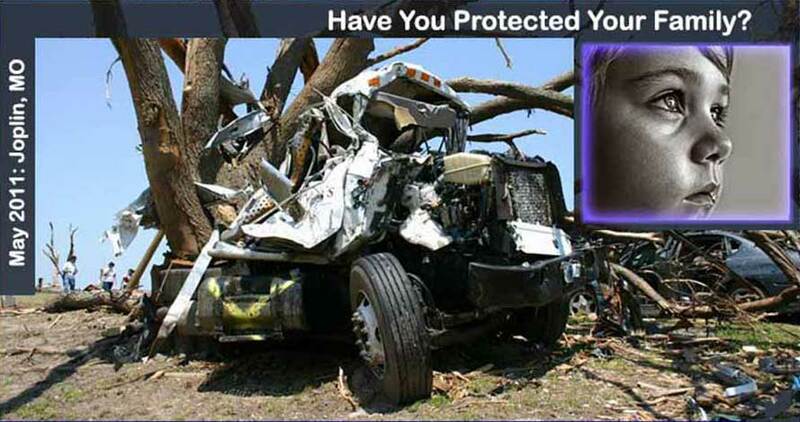 In an average year, 800 tornadoes are reported nationwide, resulting in 80 deaths and over 1,500 injuries. © Tornado Tough, LLC. 2019.